Saving money is something that interests every business owner. Sometimes your options are obvious, and they're easy to implement. However, other ways your business could save money, and even increase your business income, may not be as clear. Have you've ever felt you're in a holding pattern? You're breaking even, yet you're not breaking through. Communicating with customers and between employees using more efficient tools helps you capture previously lost opportunities. And it supports your ability to scale up your business. Shifting to a work environment where you place less multi-tasking demands upon your employees grows your income potential by increasing productive time. Reducing your software and technology costs while increasing efficiency is every business' goal. Original CMP helps with that. Focusing your time on income generating activities and delegating tasks you could do, but others do more efficiently is a proven growth strategy. Making brand building a part of every business activity may be difficult to measure, yet every happy customer is potential referral source as well as a potential repeat customer. Here's more information on how Original CMP could help you recover hidden income.. Silos. They're very effective in agriculture. Not so operative in other businesses. Most IT professionals recognize the issue. Communication silos can exist as well. When you eliminate them, you tap into hidden income. Interconnection is essential. When your management tools empower that, you gain money. Here are just a few examples. Your sales team and production team may overlap, especially in a startup. Even when you have a dedicated sales team, you may have inside sales providing support to the customers your outside sales teams brings on board. When communication flows between all of these employees, your follow up times are fast. Because every opportunity reaches the right person, your find money by eradicating failures to follow-up on ops. Example user activity screen for our client EJP. You probably already recognize that your website is a key communication channel to the outside world. You may already be using one of the content management systems (CMS) like WordPress to interact with the world and to manage your website efficiently. Original CMP is a completely custom solution with the all the CMS power of WordPress, yet with far more to offer. You have a complete management portal. You still have one convenient portal for managing your website, plus a portal to better communication and more. These are just a few of the ways that Original CMP can improve your communication. Augment communication between the separate facets of your business, e.g. customer service, production, R&D, purchasing, marketing, sales, inventory control, HR and financial. 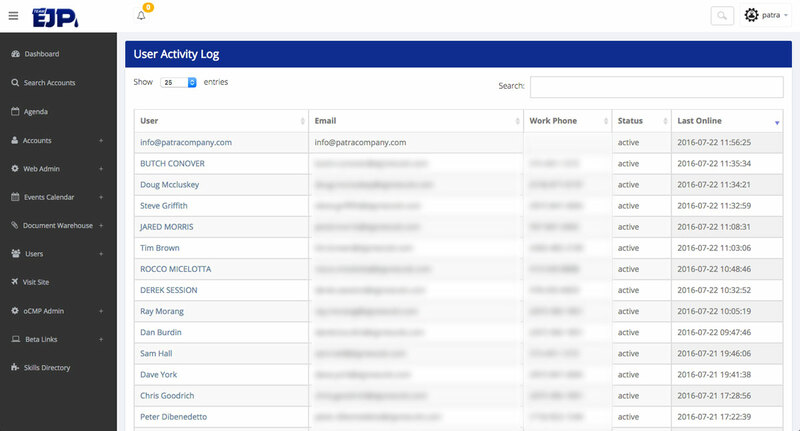 Give a 'big picture' view to every employee who logs into the portal. Enable direct communication through your website from your customers to you. Consider how bringing every member of your team on board so they cooperate in communicating with your customers would grow your business. The whole team understands how they complement each other's roles, so customer-facing actions such as nurturing leads coordinate more effectively. As a result, you close more sales, and you transform the hidden money drain into an identifiable income pump. It's a proven fact. Multi-tasking cuts productivity significantly. Every time you have to switch to a new task your brain has to reset. A graphic produced by Todd Herman shows just how dramatic this cost can be. In it, he shows how trying to manage two projects simultaneously leads to a 20% loss in productivity through 'context switching.' Try managing three projects concurrently and the loss goes up to 40%. Four projects reduce productive time to only 10% per project with 60% of the day going to waste. By the time you try to manage five projects concurrently, you're only spending 25% of your day actually working and 75% switching between jobs. "But we're not doing that!" Are you sure? How much of your team's time is spent in 'context switching' between different management tools? It might not be a major issue in a large company where you have employees dedicated to separate aspects of the business, however, in a small business setting most employees fill multiple roles. How much money would your business save if your employees could log in to one portal and follow a systematic procedure for accomplishing essential income supporting tasks each day? Reduces context-switching time by using one screen for all the common tasks required to run your business profitably. Facilitates fast switching between tasks by keeping everything you need to monitor on the same screen. Keeps learning and use simple, so even non-techies can learn fast. Saves you money by cutting training time. Employees learn to use one program, instead of having to learn multiple pieces of software. Opens up your hiring options by allowing you to explore candidates with non-technical strengths. Strengthens each team member's contribution by making the factors that build your business visible and actionable. Ensures necessary multi-tasking functions flow effectively through your business-specific process flow by removing guesswork from procedures and by automatically advancing widgets and contacts into the appropriate channels. Because Original CMP is customized to your business processes, you can turn every person on your sales team into an efficient customer relationship manager and inventory control manager. The tools they need are right there in the dashboard, providing the information they need. 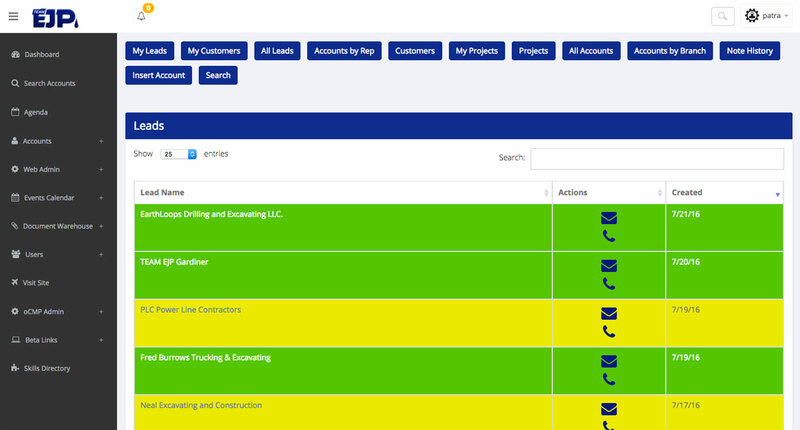 They can even use the Process Tracker to track their sales flow against specific goals and checkpoints. Our custom tools improve efficiency by streamlining tasks. Let's look at the many tools your business may be using. Here's another area in your business where you could be using a silo approach. You could be spending too much, while entrenching inefficiency into the management of your business. 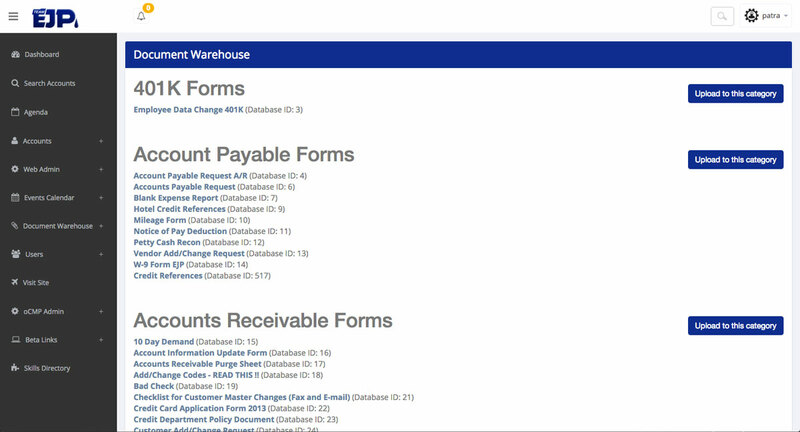 Example document management screen for our client EJP. Original CMP saves you money by integrating all the essential management aspects of your business. Original CMP cuts away the unnecessary to focus on what you need to grow your business. Here are some of the key elements we bring together. Having a website is essential. Everyone agrees on this. However, it's usually treated as a stand-alone business tool. Not with Original CMP. We've developed a unique CMP core with CMS as one of its components. Thus it's built for business, from the beginning. You're not adding plugins trying to get WordPress to work with your business. That's why Original CMP is capable of doing even more. There are multiple shopping cart options. The most effective are those which don't take customers away from your website. However, carts that integrate with PayPal can also be effective. With Original CMP, you have fully integrated shopping cart functions that communicate with your existing inventory control. Or we can customize your cart as one of Original CMP's components. We give you the option to teach website orders to go directly into the appropriate production queue. Accurate order handling is just another way Original CMP uncovers hidden income. Integrating this tool into Original CMP ensures accurate management of your inventory. Shopping cart sales generate sales orders, so warehousing can fill orders quickly. The inventory control manager can also facilitate stock management and manage sales orders and purchase orders generated by your sales team. Original CMP focuses on both aspects of customer relationships--maintaining existing clients and nurturing leads. This means we incorporate customer service components such as support. We also include lead nurturing a tool for automating lead nurturing sequences. Example CRM for our client EJP. CRM can also embrace a membership component where customers find additional support. Memberships for pre-purchase exploration can be directed to sales, and then be upgraded post-purchase to offer full support functions. Projects can take many forms. That's why Original CMP is customized to fit your business needs. Our Process Tracker simplifies setting up and tracking team workflow based upon your business needs. You set your specific goals and establish checkpoints along the path. If your projects include frequent document exchange, we can set up document managing capabilities. Need to assign tasks? Work in groups? We can include that too. Have a custom manufacturing environment? We customize Original CMP so you can track every touch point of your process, no matter what your company makes. Most entrepreneurs get trapped into the do-it-yourself mode during startup. Cash is tight and time is an alluring exchange. If you've been lured into the do-it-yourself mode by all the plugins WordPress offers, you're not alone. There's a plugin that will do just about anything you can dream of on WordPress. And yes, you can cobble together a solution using WordPress plugins that give you some business management tools. We agree with you on that. There are hundreds of plugins promising to help you manage things such as scheduling with clients and even projects. However, identifying which plugins are compatible with your theme and provide the functionality you need is time consuming for multiple reasons. Not all plugins play well with each other. Code for one may crash another one. Some plugins may cause strange behaviors on your website. Some plugins may give hackers entrance. In addition, if you've spent any time looking for the right plugin options, you already know it takes time. That's time spent not earning money. That is fine if your goal is to sell yourself as a web designer, but that's not so good if your business focuses on something else. Not good if your business focuses on something else. In addition, depending upon WordPress plugins to hold a cohesive, business management solution together is less effective than approaching your website as a component of your complete business management platform. You'll find that working with a team of experts to customize your website's functions to harmonize with managing your business is a far better investment than trying to turn a blogging platform into something it was never designed to be. When you choose to delegate, you're faced with two choices: Out of the box or custom. So many of the out-of-the-box solutions don't offer complete flexibility to tailor the product to your brand. They force you to retain non-industry specific verbiage. They might not offer you all the functions you need. They usually include functions you don't need, creating confusion, especially for new users. They may be slow to respond when unforeseen situations and problems arise or when bug fixes and software patches are needed. They could require local IT administration. The advantage of Original CMP is the way it delivers on the inherent desire every business owner has to work with purpose-built tools. This is one investment that is built to empower business growth. 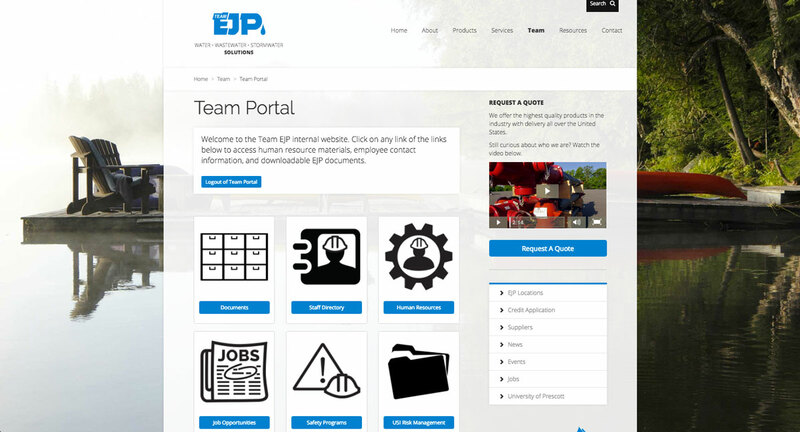 Example Team Portal for our client EJP. We explore your business needs so we build your complete management portal to fit your business. We create a streamlined environment where what you need, and nothing more, is accessed from one location. Less distractions. More productivity. We incorporate your industry verbiage to enhance the experience of both customers and employees. We adapt your solution as unforeseen situations and problems arise. We respond quickly to fix 'bugs'--those irritating issues where an action doesn't execute, for example--and issue software patches rapidly. While there is a time delay when you go with a custom solution, you can be assured Original CMP will never require extra local IT administration. Because we base our solution in the cloud, you're free to invest your resources on more profitable aspects of business. As a result you uncover hidden income. Branding can be one of the most difficult ROIs to track. However using David Ogilvy's definition, let's explore how Original CMP could reduce losses from negative interaction with your brand and improve the way customers feel about your brand. "The intangible sum of a product's attributes: its name, packaging, and price, its history, its reputation, and the way it's advertised." How does Original CMP help you better manage these factors connected with your brand? We weren't involved in choosing the name or packaging. History can't be altered. However, there are two main areas we contribute to--price and reputation. We can also help you manage your advertising campaigns, though we're not involved in how you advertise. Increased efficiency using Original CMP helps you control your costs so you can stay competitive. Improved supply chain management recovers costs lost to over- and under-ordering allowing tighter pricing when competition gets stiff. Better management across the entire organization could enable increased production without increased labor costs. Better delivery management keeps customers happier. Superior handling of customer concerns increases their confidence in your products or services. Truly helpful pre-sales contacts fosters confidence in your company. Dependable customer support post-sale has your customers praising your company. Because we customize Original CMP to enable you to manage the key aspects of your business effectively and efficiently, we're also complementing every effort you make to develop a name with a good reputation. So even if branding is intangible, CMP makes it manageable. When you're able to organize your branding and related information in one central location, it helps shelter your business from brand slip. You actively organize your entire team to become dynamic players in building your brand's reputation. Original CMP is your partner in achieving business goals. Centralized data, reporting and access from anywhere means every member of your team becomes a greater asset to the whole. Whether you're a startup or an established enterprise, the team behind Original CMP is positioned to support your growth. We invite you to contact us today to learn more of what Original CMP could do for your business. Previous Post Hotels, Resorts and Inns: Do Your Photos Push Business to Your Competition?